No one noticed last month when Shazia, 19, was stoned, burnt with acid, and then shot dead for an unknown sin in Mardan, the second largest town in northern Pakistan after Peshawar. Originally from a village in the Swat Valley, Shazia was snatched by her ex-husband from her mother, taken into the mountains, tortured, and eventually killed. Her mother, Noor Jehan, a widow with no male relatives, has lodged complaints at three different police stations about her daughter’s fate, but her wailing, so far, has fallen on deaf ears. Law-enforcement agents keep telling her that “investigations are under way." Days before Shazia’s heinous murder, another woman was stripped and paraded around Haripur, a city near the now-infamous suburb of Abbotabad, the last dwelling of Al-Qaeda chief Osama bin Laden. The woman, in her 50s, was punished because her son was found guilty of having illicit relations with the wife of another man. This was the local jirga’s sentence to “restore” the man’s honor -- although it dishonored an innocent woman. The two women are not exceptions. A Thomson Reuters Foundation expert poll lists Pakistan as the third most dangerous country for women in the world, just behind its war-ravaged neighbor Afghanistan and the Congo. The Human Rights Commission of Pakistan (HRCP) says “around 3,000 women were raped and another 791 murdered for honor in 2010 alone.” This is apart from the thousands of unreported cases when women are bartered, exchanged to settle family disputes, harassed in their work places, forced into marriage in childhood, or married off to men double and triple their age. I still remember the daylight murder of a budding female singer, Ayman Odhas, in the city of Peshawar in 2009 by her own brothers for appearing on television, a move that defied the family norms. Although Odhas was an adult, living with her husband who had no objection to her singing on television and the stage, her brothers felt the act dishonored them. One morning they knocked on her door, before shooting her repeatedly when she stepped out to meet her visitors. This shows the collective mentality of a society where women, instead of being thought of as equals, are dealt as a commodity owned by men -- father, brother, or husband -- from birth to death. These owners reserve every right to treat her as a commodity in terms of settling honor or blood disputes, monetary matters, marriage, or any other situation that may arise. 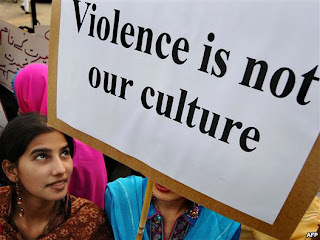 Domestic violence is often ignored as a petty dispute and has become part of the culture where many people are living in a joint-family system. Interestingly enough, no Pakistani political or religious party paid any attention to the woman paraded in Haripur or the murder of Shazia in Mardan. They were vocal, however, about the detention of Dr. Aafia Siddiqi, who was sentenced last year in the United States to 86 years in prison after being found guilty of attempting to kill her U.S. interrogators in Afghanistan. With the exception of a few nominal statements from HRCP or the Aurat Foundation, a women’s advocacy organization, no feathers are ruffled in Pakistani government circles at the federal nor provincial level, where the secular Pakistan People’s Party (PPP) of late Benazir Bhutto and Awami National Party (ANP) are ruling the roost, respectively. Perhaps killing, forced marriage, or the dishonoring of a woman is not that important for a government in a country where scores are killed and maimed in bomb explosions in the name of religion. It is a sad irony that these so-called religious warriors struggle throughout their life to attain several beautiful women in the afterlife.